STEMteachersNYC cultivates excellence in STEM teaching and promotes deep understanding and success for students through innovative, teacher-led professional development. Our weekend workshops are offered during the school year and multi-week workshop intensives occur in the summer, led by master teachers. We welcome and encourage teachers from across the globe, the US, and the local New York City area! For teachers, by teachers, about teaching. STEMteachersNYC is a non-profit type B corporation and 501(c)3 non-profit organization (public charity), EIN: 46-4068881. STEMteachersNYC is a Continuing Teacher and Leader Education provider, registered with the New York State Education Department (CTLE ID# 3385). STEMteachersNYC is also registered as a vendor for the NYC Department of Education (Vendor #: STE-068881). Donations to STEMteachersNYC are tax deductible. STEMteachersNYC was founded in 2011 by a group of physics teachers as a local affiliate of the American Modeling Teachers Association. 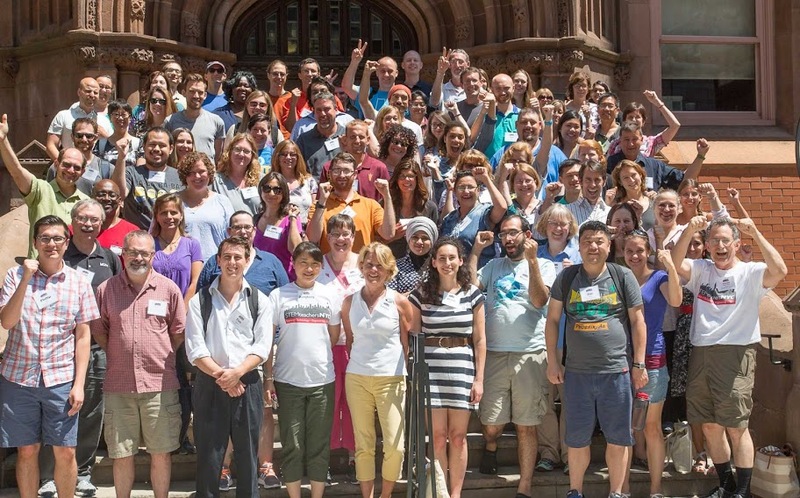 The founders and the current coordinators of STEMteachersNYC are almost all teachers who had participated in 3-week summer Modeling Instruction Workshops and adopted Modeling Instruction in their teaching. Brunschwig, it has grown from an initial group of 25 to more than 1,000 teachers who are members of the organization’s on-line professional forum. Program offerings have grown from 8 weekend workshops and a single 3-week intensive summer workshop on mechanics in physics in 2011-12, to 21 weekend workshops and nearly a dozen simultaneous summer workshops. Workshop participants are teachers in public schools, charter schools, and private schools from throughout the NY, NJ and CT metropolitan area. The summer workshops also draw participants from across the country and abroad. The impact of these workshops is significant. Since 2012, we have presented over 175 workshops that have attracted over 3500 teachers to intensive professional development experiences on their own time on the weekend or in the summer. During 2013-14, STEMteachersNYC adopted by-laws, established a board of trustees, and submitted the application for tax-exempt status. In the 2014-15 academic year, the IRS approved our application for tax-exempt, 501(c)(3) status, and we doubled the number of weekend workshops. Our long-term goal is to reach 25% of the region’s 21,000 STEM teachers and impact over 250,000 students.